Last week I dropped my phone in the supermarket and it popped apart and the battery went skittering across the floor. Everything seems to be okay with it, but it scared me. This phone is literally the most valuable thing I own, both in price and general usefulness, and it would have been devastating to lose it because it slipped out of my shirt pocket when I bent over to pick up a bag of dog food. So tonight I decided I’d spend some of my writer’s block time shopping for a protective cover for it. I went to Amazon to do this because I’m poor and a little cheap, and also an Amazon Prime member, so I wanted to find a cheap one with free two-day shipping. I told Amazon to show me only Prime eligible items, to NOT show me “add-on” items, and to sort the list from lowest price to highest. I loved that I could get it all on one screen. The prices bear no apparent relationship with the order of items shown, and right next to each other is one that’s an add-on and one that’s not Prime. 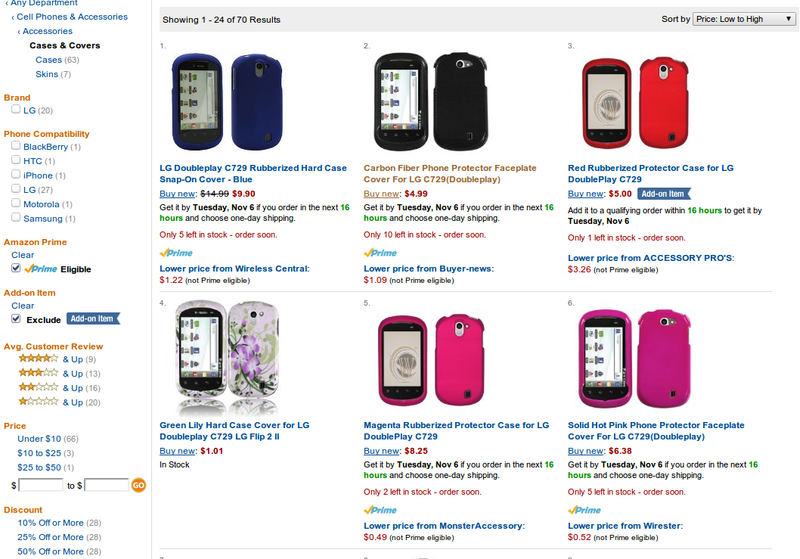 So, Amazon, if you’re not going to apply the filters I select, I must ask why they are even there? Posted on November 4, 2012, in Daily Post and tagged Amazon, gadgets, postaday2012, They don't seem to have my favorite shade of purple..., weirdness. Bookmark the permalink. 5 Comments. I’ve been noticing this for some time now. Endlessly frustrating. I usually end up finding the highend for what I’m looking for and applying a custom filter (which still excludes items that are on sale) so yeah. Not a lot of browsing for stuff on amazon anymore. Yeah, I’ve been sort of generally aware that their filters don’t seem to work for a while, but usually they at least kind of work. Completely ignoring three out of three is a bit more than usual. Plus I was able to get the whole thing in one screenshot! I hate search on Amazon. It does seem to take rather more digging than one would like. I’m always wishing I could browse through just the free kindle books. I can sort of understand them wanting to show me the pricey ones, too, but I’m far more likely to give an unknown author a try if I can get a complete novel for free. The WBI books are a good example, if I hadn’t got the first one free, I would never have bought the second! Sometimes I search elsewhere, then enter the exact terms in Amazon.